The Corporate Tenant’s Assignment And Sublease Strategy, and the Lease Clause Critique: The Killer Corporate Pro-Tenant Assignment and Sublease Clause. Corporate America’s appetite for commercial real estate assets comes and goes, and this LARG concerns the periods when it is mostly going. Take, for example, Bell Atlantic Corp., the Philadelphia based baby bell. Some time ago, that company announced the sale of its real estate development arm to a management group financed by Lazard Freres for about $300 million. The sale included fifty-six office and industrial buildings in the middle Atlantic states comprising about 4.1 million square feet. Bell Atlantic was on the prowl for cash after deciding to gobble up Nynex for $32 billion. Bell Atlantic thus joined the parade of large companies liquidating some or all of their real estate holdings in order to invest the proceeds in their core businesses or to return the cash to shareholders. Many corporate behemoths acquired large real estate portfolios during the 1970’s and 1980’s. Such assets were ideal for sopping up excess corporate cash flow, and the companies snapped up some real bargains during periods of real estate weakness. Back then, real estate assets were cheaper and looked like pretty good investments. In some cases corporate buyers just bought an empty office building when they needed some space. Why be a tenant and lease space when you can buy the building and fill it up with your own operations? During the last several years, companies like Mobil, Chevron, Exxon, and Sears, Roebuck and others have put heavy blocks of commercial real estate on the block and cashed out. Even companies that never had separate property development arms per se—like US West and Pacific Telesis—sold off lots of commercial properties. No doubt there are lots of good business reasons for this ongoing divestiture of corporate real estate. First among them is the flood of cash currently sloshing around the country looking to buy bricks and mortar to plug into into real estate investment trusts. Despite ostensible good business sense, these things do run in cycles, and when one big company does something, all the others wonder if they should be doing it too. As far as disposing of excess corporate real estate is concerned, once the board votes to dump the stuff, it will generally be gone yesterday. It doesn’t matter if the decision involves a bulk sale like Bell Atlantic’s, or the elimination of a single leased corporate regional operations center. assign or sublease the surplus space. 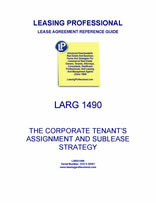 insist on its own assignment and sublease clause like the one featured in this Lease Clause Critique.